I just couldn’t resist. 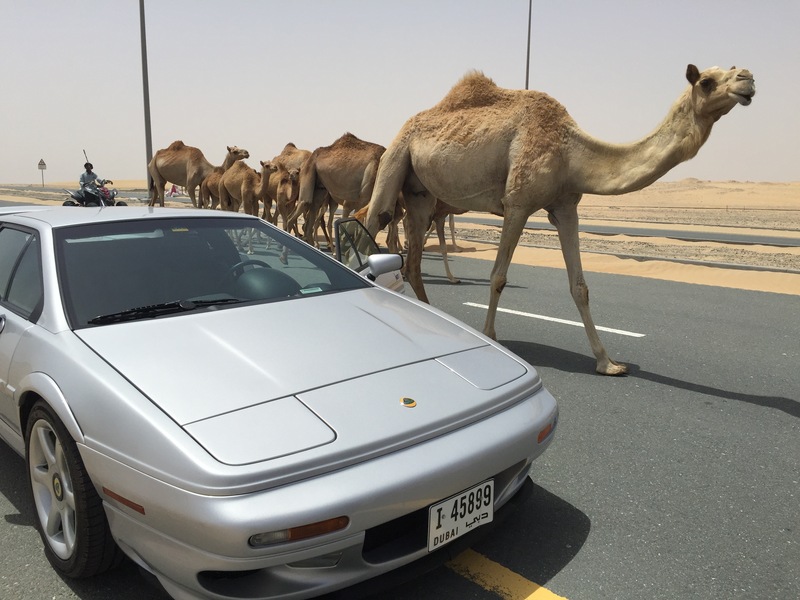 A 2001 Lotus V8, 3.5L twin-turbo with around 2000 miles on the clock for sale in the UAE. Okay it was way over in Ras al Khaimah, but it was surely worth a look, and it was. It always seems there is a long story and in this case there was, a long story and a long process. First the car – yes it was perfect. Documented real mileage, spotless, the updated interior etc, etc. It didn’t start, but that wasn’t a concern – it had been standing for some time as the 6ft 8inch custodian couldn’t exactly squeeze into the car to start it regularly! Custodian seems a strange choice of words, but that’s who I met to view the car, here’s the back story. The owner, a lovely man, had an extruded aluminium company and was living in the UK working with Lotus. He had the contract for the design and production of the modern Elise’s front suspension if I remember correctly. An American he just loved the Esprit and ordered one. Planning to use it touring Europe and one day taking it home to the US he ordered it through Belgium as an LHD to US Federal Spec, to be delivered to the home of Lotus in Norfolk, UK. He put about 1,000 miles on the clocks that first year and then sold his company to a UAE business. He moved out here and had the car shipped. Unfortunately he never registered the car here, nor received a VCC import clearance certificate. He did use it here rarely though on the Belgian plates and had it serviced. Unfortunately, he was taken ill whilst in the US and has been there for the last few years with ongoing treatment. He left the car with his neighbour, the 6ft 8 custodian, to look after until his return, but after a year or so realized this will probably never happen and put it up for sale. Often this backstory tells you to run a mile, scam!, I mean the car was cheap? However, having met the custodian and spoken with the owner on phone and skype I knew it was legitimate. But being a legitimate sale wasn’t even half of the problem. UAE and US bureaucracy was! First problem, you have to be present to sell a car in the UAE and clearly the owner was unfit to travel. You can sign over the rights to someone else, but again that needs to be done in person and of course this wasn’t. We did manage, but getting that Power of Attorney for the custodian involved the US State Department, the UAE Embassy in the US, the Ministry of Foreign Affairs in the UAE, lots of signing, lots of certified transactions etc, etc. It was a truly painfully and quite costly process and one I’d try and avoid in future, but the goal was worth it and we got there – the custodian had the ability to sell the car. But, of course, it is never that simple. Whilst he could now sell it, the car wasn’t registered and didn’t have the import certificate from 4 years earlier! RTA, Customs, Police, were not a lot of help, but we eventually drilled down to the fact we needed the Customs Certificate to start the process. Waiting in queues got us nowhere so I ‘door-stepped’ the manager on duty at Rashid Port. It turned out he was a lovely chap, looked up various bits and sent me off to Jebel Ali. Where I ‘door-stepped’ the next guy, who equally nice signed a few bits to get rid of me. Eventually a VCC appeared, a bit of fun with the Police ensued, but we eventually got there. Deal done, the car was mine. The ever faithful AAA looked at the car, scratched their head, but dug in. A couple of fuel pumps later, a new set of tyres and the car was perfect. What a car. I actually preferred it to my NSX, probably as it was a manual, but it really was a stunning car. I drove it every day, even when the AC played up! Ever a crowd drawer it was featured in Dubai’s Wheels magazine and on Motoring Middle East online and in video. … and then came the move to the USA. Another long story cut short – they wouldn’t let me import it. I could probably have fought it harder but time was short. The US really don’t want you importing cars. My Karmann Ghia was rejected as it had left previously on a salvage certificate which I understand, but there was really no valid reason to refuse the Lotus. It was ordered, built, stamped and ID plated as a US car, it had just never been there. I communicated with the import authorites there, sent photos of the ID plates, even got a letter from Lotus UK stating it was Federal Spec, but still no. The Shippers are paranoid of fines and want pre-approval and that wasn’t forthcoming. One comedic moment was talking to a customs officer who said he wanted a letter from Lotus US rather than Lotus UK despite the UK being the ones that made the car! Time ebbed away and I didn’t need the hassle during an upheaval of the rest of my life, so like the Ghia I sold it. Like the Ghia it went to a good owner. An odd concept as often I feel that I may not be a good owner, buying these things from people that have cherished and worked on, but then me not keeping them long. But that is something for me to deal with. The Lotus went to a real enthusiast that keeps a few pristine classics in the UK, someone that can afford to look after it as it deserves.